There's a huge display by TWLUG, the Taiwan LEGO Users Group. with a fair amount of castle content. Thanks for posting this Bruce, I was wondering about these pics yesterday. There are some great MOCs there, and the time put into the display is amazing! Oh wow, there's some fantastic stuff in there! I particularly love this castle, there is some great landscaping and it actually makes me want to like KK2. And check out this awesome pirate ship! I wish I could see some higher resolution, no-reflections pics of that! I keep getting a "this file is not yet public" page. What's up with that? Everyone else seems to be able to see the MOCs. I didn't think KKII could look so amazing. kelderic wrote: I didn't think KKII could look so amazing. This is definitely a great way to improve the KKII line. However, the main problems with KKII were eliminated in this creation, including large prefab pieces. Also, is this castle in bley or old grey; I can't tell on my computer screen. Wow, these creations are all fantastic. It is a pity about the glass showcases affecting the picture quality, but from can be seen, these are truly great. I think I am going to have go and “study” some of these creations, so as to improve my own building style. Excellent! I really like the KKII battle scene and the village. The viking dragon is great aswell. The non-castle stuff is pretty good too, although most of the Star Wars stuff is just the sets, along with the exo force. But other than that it's great! I just want to ask if anyone knows what this is? To me it looks like a cross between a tank, Star Wars, and Transformers. Nevertheless it looks cool! Wow! A lot of these are just amazing! 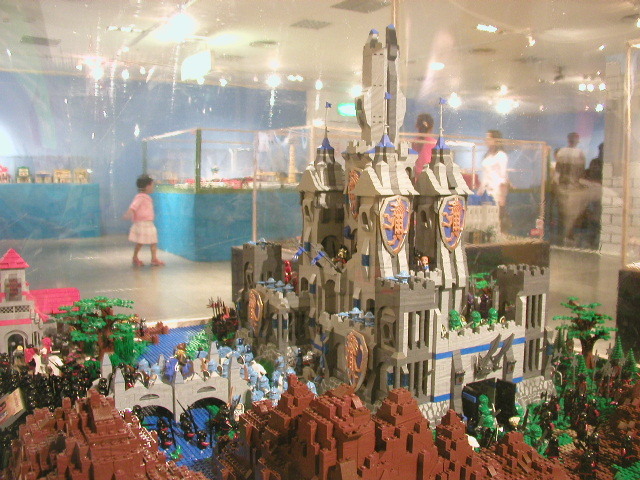 That KKII castle has to be the best one I have seen. It seems to fit along with the knights, and even inhance them. Man, that pirate ship blows me away! Impressive. I wish I could go there and see the real thing.